It works when you have a collaborative team to put all the parts together to achieve the best results. Make sure the recipients are willing and able to buy your product or service. This is your headline. What do you want them to do? Make them act now. Create an urgency in your message. What is the best time to receive your mailing? The right day, week, or time of year. Content, colors, images, and clarity keep the message simple and understandable. Direct mail works, we want to help you do it right! 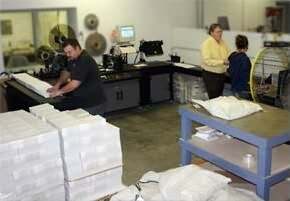 Our mailing and fulfillment services are backed by more than 15 years of experience. As your printing partner we can print your piece and mail it directly to your end users. Let us help you pick the best way to mail your piece and find the best rate, saving you valuable time as well as money on postage. We at APi-marketing are knowledgeable about postal discounts, such as bulk mail and presort, enabling us to design the perfect package for you. As your printing and mailing partner, our focus after printing is getting your direct mail or product to you and/or your customer. You supply us with your mailing list on disc or via e-mail and we will take care of the rest. Having APi-marketing keep your mailing data up to date will free up your time and get your piece out faster. It is all part of the package that makes APi-marketing the one-stop source for all your printing and mailing needs. APi-marketing can also be your go-to for direct mail advice. We know what will separate your piece from the junk mail that gets thrown in the garbage. From deciding the best size for your piece, to the best fonts, colors, design and copy, and even how many times a year to mail, APi-marketing has the staff, equipment and know-how to see your direct mail project through from concept to completion. Mailing Made Simple — This page provides a wealth of information to help you prepare your pieces for mailing and submit an effective mailing list. Mailing Terminology — Don't know your Indicia from your Barcode? This page will help you sort out the language of mailing. Mailing Specifications — Size and shape requirements for automated mailing rates (pdf). Presort Pricing — Summary of the current presort mailing charges (pdf). Targeted Pricelist —Targeted mailing list results in better ROMI (return on your marketing investment). Prices for purchased mailing list for businesses and consumers. (pdf). NCOA Processing Requirements — Information and sample of the new USPS required form for the National Change of Address software (pdf). EDDM is the solution if you are looking for complete area saturation with your mailings. If 75% or more of the residents in an area are your target market, then EDDM may be right for you. Get more details about our EDDM Specialty Market by clicking the button below. If APi-marketing is printing and mailing your piece, you will also have access to our permit number, giving you the use of our indicia. Download our indicias from our Forms Page.